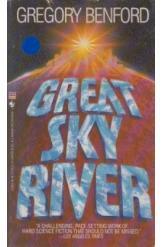 Great Sky River Gregory Benford Sci Fi. Book is in good condition, all pages intact. Galactic civilization is being exterminated by a race of superhuman artificial intelligences. Departing from the war-torn wastelands of the planet Snowglade, Killeen and his companions venture to the black hole at the heart of the galaxy to appeal to an even greater intelligence for salvation.